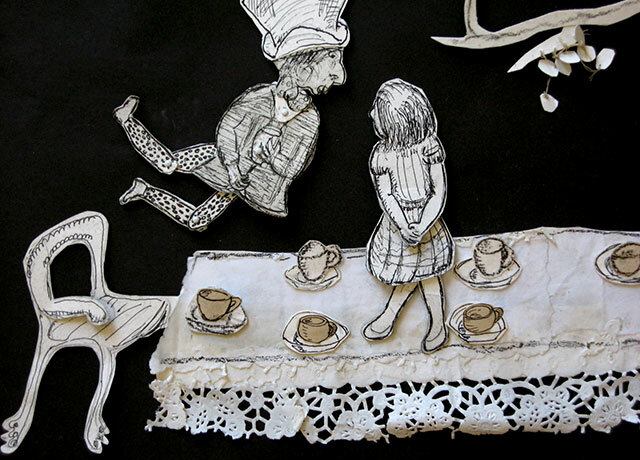 Alice’s Tea Party is a multimedia performance, in which paper doll characters from the famous story meet in live animation, accompanied by live music. Alice meets the three crazy friends and discovers the Hatter’s secret: why the time is stuck on 6 o’clock at the never ending Tea Party. Live animation: charcoal drawing, etchings, writing, erasing, cutting and crumpling paper under the video camera. My puppets are projected in real time onto a large screen while improvising with the musicians.